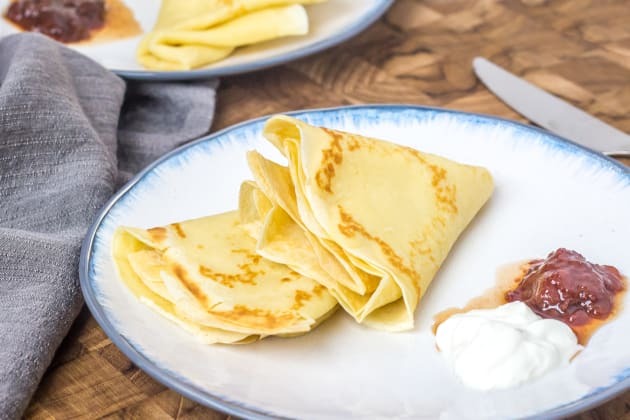 If you know how to make crepes, you’re on your way to endless options for breakfast, brunch, dessert and even dinner. That’s right ― you can make these thin pancakes sweet or savory. The main difference between sweet crepes and savory ones is…wait for it…the sugar. Omit the sugar when you want to fill your crepes with short ribs, cheese or pulled pork. 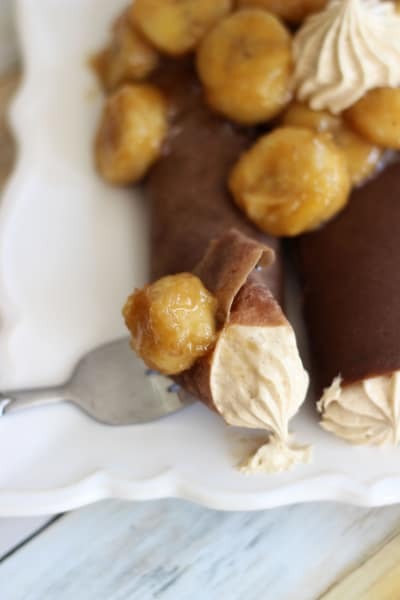 Keep the sugar when you want to fill your crepes with jam, Nutella, chocolate whipped cream or fruit compotes. Are you hungry yet? Let’s get to it. Make the batter in a blender. This ensures no lumps and the crepes are thin and delicate. Let the batter rest for at least ten minutes before the crepes are cooked. The batter can be made several hours in advance or even the night before. Just make sure to refrigerate if the batter is made more than thirty minutes in advance. A nonstick pan is essential. Depending on the nonstick quality of your pan, you might not need extra butter for the pan. Tilt the pan in a circle to help spread the batter but go slowly or you’ll get tentacle crepes rather than ideal circles. The first crepe will likely need to be tossed out. It will help you get a feel for your pan and batter. Don’t worry about this one! You’ll know when to flip your crepe because the top will look dry and one of the thinner edges will slightly curl up. A large spatula with a sharp edge will work best for flipping. In a blender, blend together egg, milk, flour and salt until batter is smooth. Heat a crepe pan or a small nonstick skillet over medium heat and melt a pat of butter to coat pan. Ladle in about 1/4 cup of batter so the batter coats the bottom of the pan. Swirl batter to evenly coat the pan. Lower heat to medium. 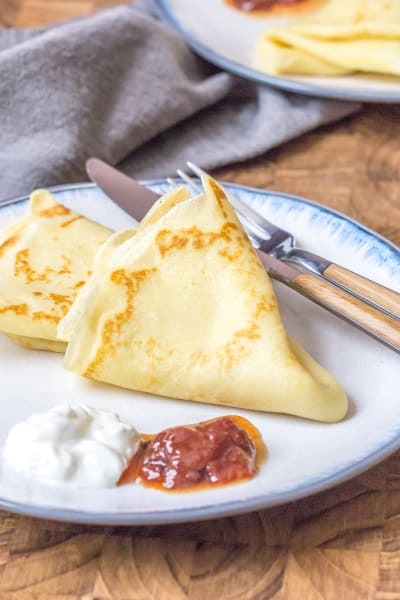 Cook for one minute, then flip and cook for another 30 seconds or until crepe is browned. Remove from pan and fold. Keep on warm platter then repeat with remaining butter and batter. 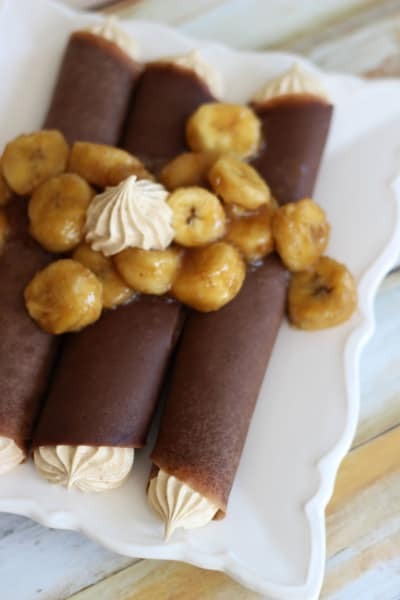 Fill the crepes with desired fillings and serve. Refrigerate crepe batter for up to three days. Store unfilled, cooked crepes in the refrigerator for up to a week, covered in plastic. 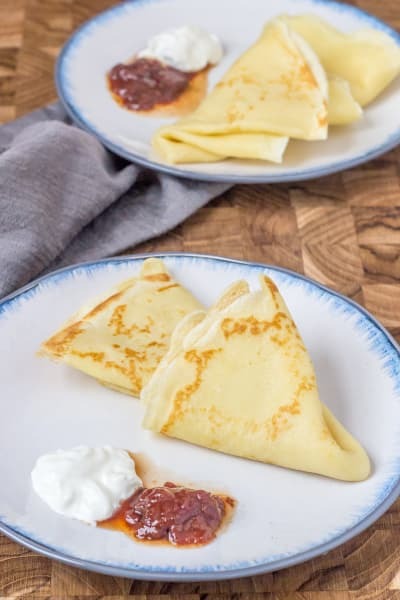 Reheat the crepes in a pan or the oven before filling them. 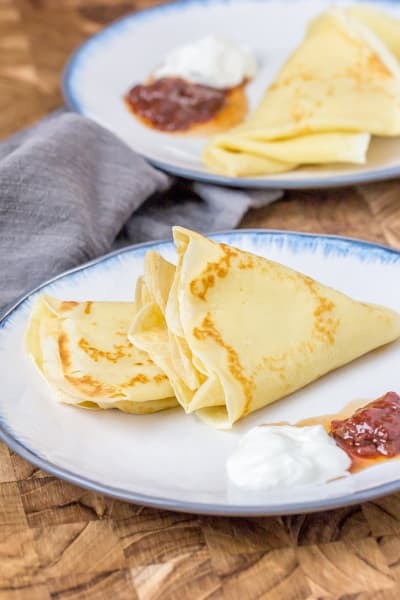 Now that you know how to make crepes, you might want to check out these gluten-free crepes, chocolate crepes or these Russian Blinchiki. 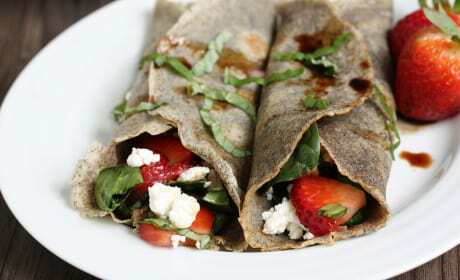 Strawberry Spinach Buckwheat Crepes are the perfect answer when you can’t decide between sweet and savory. They can even be made ahead!